The Job Carr Museum is a little log cabin nestled in the corner of Old Town Park, marking this as the “Birthplace of Tacoma.” The doors remain open to visitors Wednesday through Saturday, between the hours of 12 pm and 4 pm (1-4 pm October through May), reserved on occasion for school field trips or special events. 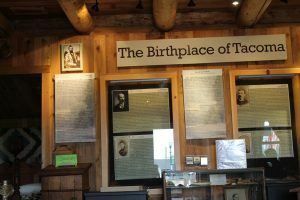 This fun and educational resource for the public requires only a hunger for history and a possible donation. 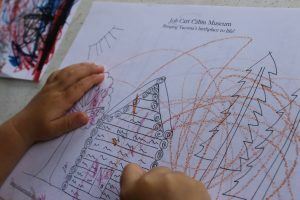 When summertime rolls around, on these magical Wednesdays, bean bag toss, hopscotch and coloring pages decorate the front porch and invite company to take part in a good tale from the pioneer days. 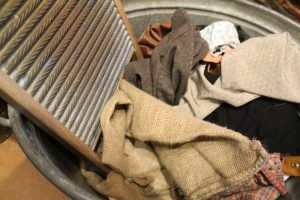 Inside little ones of all ages ornament themselves in hats, leather vests, handkerchiefs, knitted shawls and cotton dresses that sweep along the wooden floor boards. 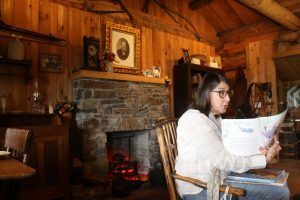 The cabin is cozy, with an imitation fire burning, hanging tools and quilts, and old portraits and story boards lining the walls. The children find their spots on the floor in a semi-circle around the afternoon’s collection of stories and Bonnie Beaudoin, who has graciously volunteered to host for the day. Before retreating outside for games and crafts, the book opens and pages come to life. 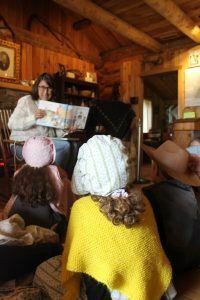 Miss Bonnie’s voice is kind but full of character and excitement compelling the children to sit quietly, for the most part, soaking up the words that take their imaginations back in time – to a time before Facebook, fancy phones and cameras; before paved roads led the roar of motor vehicles into Old Town; to simpler time of log cabins and fireside storytelling.